Document new adventures and load up your portable photo printer with some new paper. It requires zero ink. Instead, it uses ZINK printing technology, which embeds cyan, yellow, and magenta crystals into the paper. They’re activated with heat during the printing process to create a lifelike image. Dimensions: Regular (2" x 3"): 4" x 2.7" x 0.8"; Large (3" x 4.5"): 0.8" x 3" x 4.5"
Works great but pics are small. 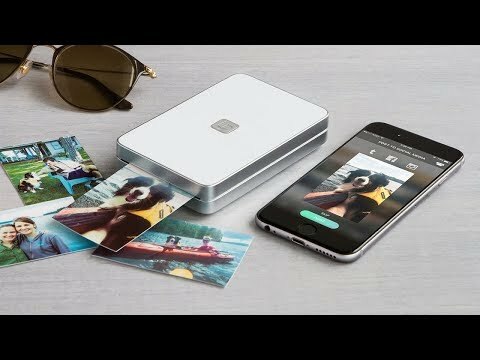 Lifeprint is a pocket-sized, inkless portable photo printer that creates sharp prints instantly. And its special software can make photos seemingly come to life. Pop out sharp photos directly from your social media accounts or camera in just 30 seconds. Its companion app has an augmented reality feature that prints video stills. When you hover over the physical print, it cues up the actual video on the app’s Liveviewer, making it come to life. Lifeprint doesn’t even need ink. It uses ZINK technology, which embeds cyan, yellow, and magenta crystals in the photo paper then activates them with heat to create a life-like image. You’ll get 10 to 15 stills on a single charge. And it only takes Lifeprint about an hour to completely power up again. Take it anywhere to transform memories into physical keepsakes you can relive whenever.